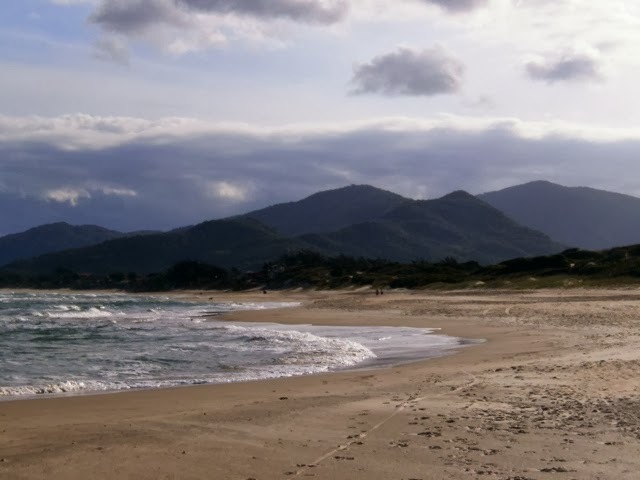 Many times during our travels when people asked us where we were going in Brazil and we replied with “Florianopolis” we were sometimes met with puzzled looks and questions of “where is that?”. Some people didn’t even know it was in Brazil. 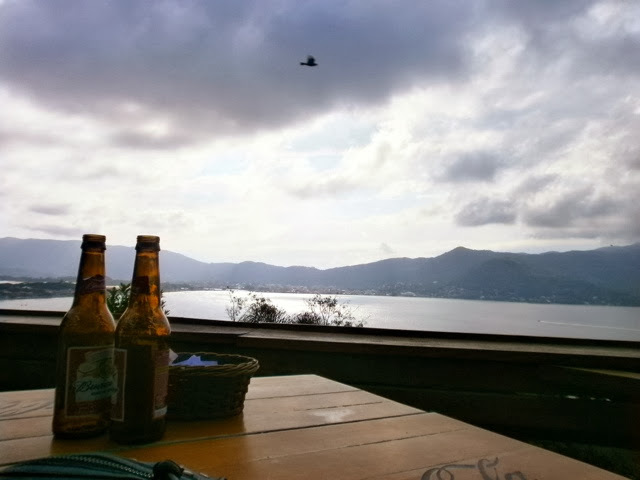 Florianopolis, or ‘Floripa’ as the locals call it, is a large island in the province of Santa Caterina in the southern part of Brazil. It is connected to the continent by three bridges, two of which are operational. Floripa has some of the best beaches in the world for surfing and is also known for its great beach parties in the summer. It’s also known as ‘the land of the beautiful people’ which is definitely true! A little unfortunately for us, we came in the off season. It was still spring so the weather was a bit temperamental, raining one day and hot the next. This also meant there weren’t as many people around and the famous beach parties weren’t happening (at least we didn’t find any). We first stayed in Praia Campeche, which is in the southern part of the island. 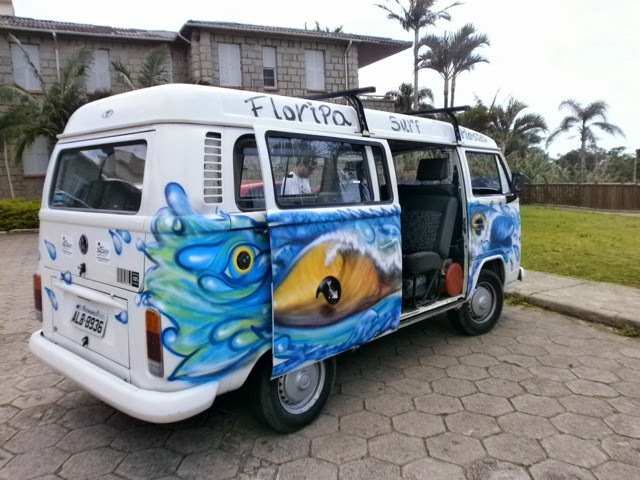 We stayed at the Floripa surf hostel which was great! We were 100 meters from the beach and had our own little unit complete with a kitchenette so we could be self sufficient for a while. Campeche beach is beautiful, there’s just something about mountains and the beach all in the same view that just wins me over every time. During our 7 days at Campeche beach we did a whole lot of relaxing. Some days we went to the beach, Tom surfed, I read my book in the hammock at the hostel, we wandered around Campeche, went into the down town and went for lots of walks along the beach. It was really nice. 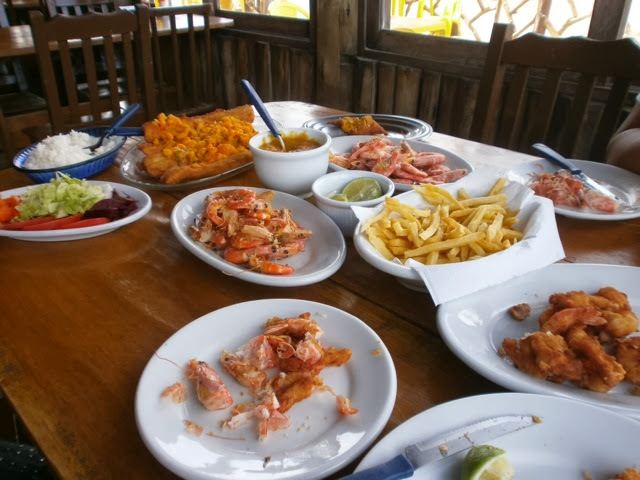 The owner of the hostel Juan, told us to go to a restaurant on the beach called Zeco and order the shrimp sequence. “It’s amazing” he told us. We ordered it not knowing what it was and wow! Were we in for a shock! Out came three plates piled high of shrimp, crab cakes, fish, rice, fries and salad. This was meant for two people but it was definitely enough to feed a family of six in my opinion! Tom and I also didn’t know how to peel a prawn so it made for a very interesting lunch! One day Juan took us on a tour of the south part of the island in his combie. The beaches were absolutely beautiful and it was so nice of Juan to take us otherwise we might never of seen all these places as they were difficult to get to with public transport. We finished the tour with some beers on the beach. It was a really nice morning. That afternoon, Juan invited us to the football with him and his friends and two other guys from the hostel. I wasn’t really sure what to expect, but I had seen numerous riots on the tv in Argentina and Brazil at football games. The fans are just so passionate about their teams. I was feeling a little nervous and hoping not to end up in a riot again like we did in Vancouver when the Canucks lost the finals in 2011. 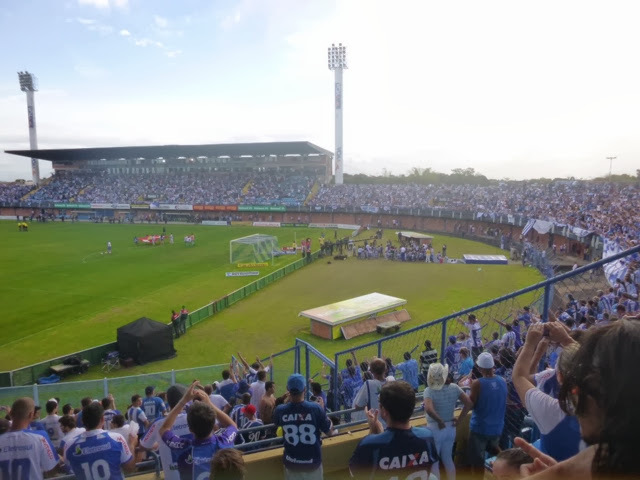 When we arrived, it was just a sea of people wearing blue. The team everyone was supporting was a local team called Avai. The opposition were in green. We saw one poor man in green with a big cut on his head. He’d been punched in the face for wearing green and we weren’t even in the stadium yet!! Once we got inside the stadium the atmosphere was electric! Everyone was so excited. Basically the whole stadium was blue with just one tiny section of people in green. They had so many different chants and songs and knew all the right times to sing them. Whenever the team scored the crowd went wild, any one would have thought they’d just won the grand final the way the fans were cheering. Unfortunately, Avai lost but there were no riots and everything went smoothly. It was a real eye opener and such a great experience to be amongst. To feel the peoples passion and excitement for a soccer game was so unreal. 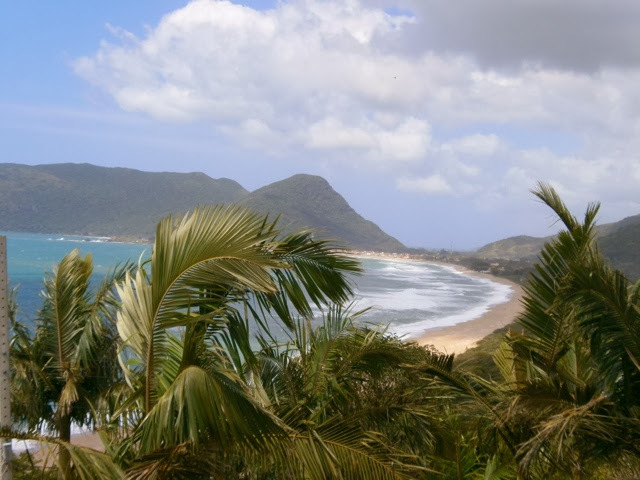 Next up, we moved further north of the island for a change of scenery to a place called Praia mole. Our hostel was called Sunset backpackers and is the largest hostel on the island. It was really cool and was located at the top of a hill with a fantastic view of the lagoa. It was just a five minute walk to Mole beach and a 15 min walk to the famous Joaquina beach, both were amazing. Although the hostel had great views, an excellent buffet and organised tours and parties every night, it seriously let itself down with the bathrooms. We’ve had some terrible bathrooms along the way, but nothing quite like this. It was a shared bathroom with the toilet located actually INSIDE the shower cubicle. I’m talking like you actually had to walk through the shower screen, into the shower to use the toilet. SERIOUSLY, who designed that!? Why would any one ever think that’s hygienic and perfectly fine? Not me that’s for sure! We spent these 7 days much the same as the first 7 days. Relaxing, soaking up the great views, lying on the beach, drinking beers and caprhinas, wandering around town and eating some great food. We experienced our first Brazillian BBQ at the hostel and it was amazing! All in all, I loved our visit to Floripa. The beaches were beautiful, Tom loved the surfing and the people just seemed to have such a relaxed and happy attitude. Everyone is also into health and fitness. There are gyms everywhere you look or people going for runs or walks along the beach. The food is fresh and healthy and everyone just loves getting outside. The locals gathered in big groups of family or friends at the beach and drank beers, played racquet ball, sun baked and just hung out. This is the life! Be sure to leave your full bottom bathers at home when visiting here! Everyone of all shapes, ages and sizes wear teeny tiny or even g-string bikini bottoms. I wasn’t brave enough and just looked like a granny in my full bottom bathers….oh wait..even the grannies wear g-string bikinis here! !